"The accepted view is that Otoucha is the same word as Toanche, meaning the “double landing place,” which, incidentally is not to be confused with the location of the present-day community of Toanche. Rather, it was most likely that Champlain landed at the double sided promontory of Methodist Point in Awenda Provincial Park. However, pinpointing Champlain at any specific spot in Huronia is like trying to life globules of mercury with a fork. With rare exception, it is impossible to pinpoint any of the locations of Indian villages Champlain visited on today’s map simply because there are no remaining demographic landmarks. 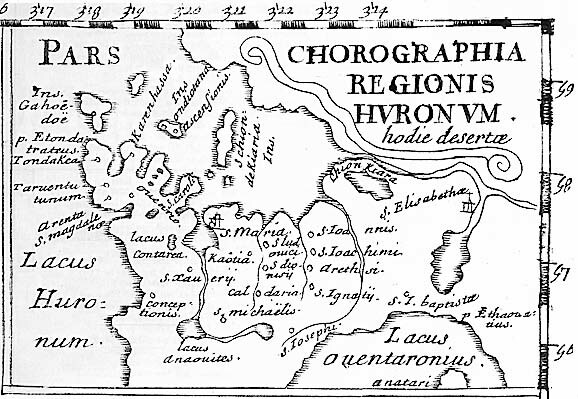 According to archaelogical expertise, Huronia at this time in the seventeenth century had the largest concentration of Indians anywhere in North America (now estimated to have been about 20,000), but most Huron villages moved any time after a period of ten years and one record suggests there were as many as four hundred villages in the region. Having abandoned the practice of providing regional maps, with geographical points of reference, Champlain isn’t much help. However, what is lost in geographical detail is made for with entertaining ethnographic observations." The bolded italics above are my emphasis. Why my emphasis? I found this to be a startling factoid. “the largest concentration of Indians anywhere in North America” – is this opinion still held? If yes, then it seems to me that this is a point well worth making about Huronia history, certainly a point that might well be worth be emphasizing on the Huronia Museum website and any web page that might be built about Huronia History and information about that history. Armstrong wrote this book in response to the Quebec Sovereignty Referendum and casts a critical eye on previous texts and certain analyses offered by other historians. He tries to make a careful analysis of the original source materials and to imagine what happened from the viewpoint of Champlain. I have assumed that Otoucha was the actual landing place or port of entry for the village of Toanche that would have been somewhat inland according to Brebeuf’s later reference. I believe that few if any Wendat villages were built right on or within easy sight of the shore. Toanche could also be further west, closer to Cedar Pt. according to AF Hunter in his report of his exploration of the area in 1887. This is his site # 3 in Tiny Twp. How Long a Trip Was It? A Tiny bit of interest.